Although we keep fighting the flow of anonymous campaign cash fuelling dishonest attacks against Obama and other Democratic candidates, let us not forget that there are also corporations, that we do know about, fuelling attack ads that are just as bad. Eventually stupidity like this will surface.Toilet paper, and hamburgers will not cost this election. How about boycotting some of Obama's contributers: BP, Shell. Mobile.....I bet they make more than White Castle, Marriott, Dixie, and Angel Soft combined. What a foolish article. It is true that BIg Oil donates to BOTH sides BUT 75% of what they give goes to the GOP. Thanks Tom, Allan you need to get you facts right big oil does give to both parties but most of the money is giving to the GOP. Many of the corporate kingdom creeps give those small token contributions to Democrats just so those who learn from superficial research and soundbites will say "see...both sides do the same thing..." propaganda campaign for that lame demographic...done...and they didn't spend a dime. Old trick...been doing it for decades. Thanks, Tom for this. Saving this, also passing on. Thanks TomCat. I will never eat another slider again!!! I already don't use those brands but it's interesting to see anyway. Thank you. Most of these brands aren't up here with the exception of the hotels which are way beyond my retired means. The one I watch for is Georgia Pacific. Dixie is up here but if I need paper plates, I use Royal Chinet which is a family owned Canadian company with headquarters in Nova Scotia. Sometimes it is tough to find all the info you want but it is certainly worth looking. Of course being north of the 49th, things are a little different when it comes to products. The ones I don't like are the ones that say 'Made in the USA for�' because many don't say which company in the US made it, unless it is food. Thanks, Tom. Don't use any of thier products anyway but good to know and good to pass on! only one I ever shop at....and will stop now...is Menards....no more! Thanks for posting. I don't really need quilted Northern, I can buy something else. Sad to see Menard's on the list though. Making my list now. Only a couple of those Brands I use, but no more. Kudos to Vegan Laura and Mary for correctly countering InsaniTEA. John, I agree that all outside campaign and pseudo-issue ads should be stopped, but I have seen no Democratic ads that were not truthful. That's the big difference. While I'm boycotting a couple of those over service issues or bad company policy, I'm primarily boycotting 7-Eleven (Southland is run by libtards), Squab City ('chicken' plastic fast food joint with stupid cow adverts), Target (lousy corporate policy of displacing neighbourhoods to plant their lousy stores where they're not wanted), and several large national newspapers (and all TV news) for severe political slant. These aren't the only ones, and I protest both libtard extremist and theocrat right wing extremists for the damage they do. I'm in Europe, and I don't buy "Pepsi" (=Republican). Green stars to you, TomCat. Thanks TomCat, like paul m, I don't know any of the brands either. Thanks TomCat. 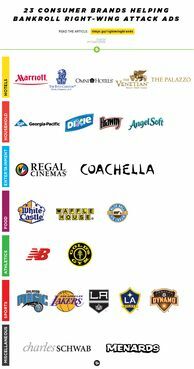 I don't use any of the brands listed, but, as Kit B. mentioned, we don't know how many brands are out there from just this list. And these are the ones we know about. Looks like I just added a couple more to my list. Thanks Tom. Noted. Adding my thanks, as well, for posting this, Tom. Will put this list on my fridge for family to also boycott. Saw another article today listing 5 fast food mega-donors: Chick-Fil-A is anti-gay, Carl's Jr. & Domino's Pizza support anti-woman causes, White Castle donates to Rep. John Boehner, and Waffle House donates to Karl Rove approved SuperPACs. My young adult kids weren't too happy to learn about some of these, but I told them I left it up to their conscience. I don't use any of these brands.. noted. Thanks for providing this information, Tom! Bye bye, Noob Balance...so long, farewell, auf wiedersehen, goodbye. I usually buy Brand X to save money :-), but there are a couple on the list that I can avoid. Thanks, Tom. Thanks TC - as these major companies all own other companies - has anyone got access to a copy of 'Who owns Whom' - a directory I saw in the 80s that cost hundreds of pounds a copy then - and it showed that(for example) a huge chemical and oil based multinational owned dozens of other companies as diverse as other chemical and oil companies, nurseries, flower and veg seed sellers and Granny Whoosits Old Fashioned Cakes - it was an eye-opener! It seems possible these companies own other ones all over the world - we could organise a world wide boycott! Awesome! Apparently I am already boycotting them. I just don't buy big brand/ name brand stuff or brands that cam afford to advertise ir provide coupons in Subday papers. Don�t use them anyway, thanks!